If you’re looking for a trustworthy plumbing contractor, one that emphasizes professional service, pride in workmanship and respect for your home, Schaaf Plumbing & Heating is at your service. When you call us for help, you will always reach a helpful staff member—even weekends and holidays. We feature 24-hour emergency plumbing service because we know the unexpected can happen. When it does, think Schaaf Plumbing & Heating! With over 75 years of experience in the plumbing, heating and remodeling fields, our highly trained technicians are prepared to handle any job, no matter the size. 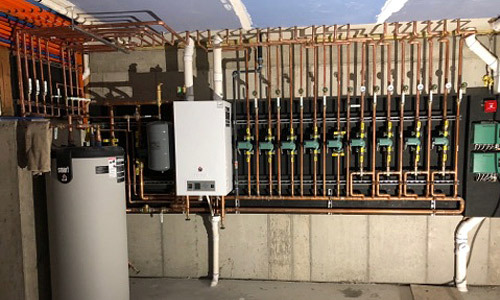 Whether you need plumbing or heating services, bathroom or kitchen remodels, clogged sewer or drain services, water heater repairs or water filtration systems installed, our expert plumbers will get it done in a prompt, professional manner—all at an affordable price. Located in Ridgefield, New Jersey we proudly serve Bergen County and surrounding areas. Give us a call; we’d be happy to discuss your project in detail. Drain Cleaning: If you are having trouble with your shower, tub, sink, toilet, floor, pool, or any other drain on your property, we can help 24/7. Water Heater Service: Leak Detection, Repairs, Replacements and Installs—we do it all! Need a quick water heater repair? Is your current water heater leaking, and you think you might need a new one? 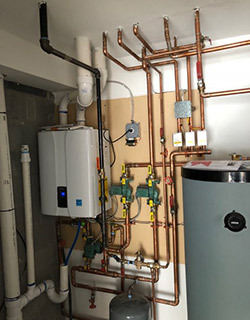 A leaking water heater is a fairly common plumbing problem, but it can cause serious damage, not to mention, you may notice an increase in your water, gas/electrical bills. If your water heater is leaking, the tank is never full; as a result, your unit is working extra hard to fill it. Our technicians will recommend the ideal unit for your home or building and install it for you, making sure it is mounted according to code. Contact us today for a FREE estimate, and let’s talk about upgrading your current water heater to a more efficient unit. By upgrading, you’ll save money on your utility bills. We offer upfront pricing and free estimates so you’re never caught off-guard by the cost of your service. Call 201.945.4992 for a free Estimate. Your water heater is an important element of your home. When it breaks down, you need repairs fast! At Schaaf Plumbing & Heating, we’re proud to offer 24/7 emergency service when your water heater takes a dive at 4:00 am in the morning. With our upfront pricing—you’ll know the full cost of the water heater repair or replacement before we do any work, no surprises! At Schaaf Plumbing & Heating, we provide honest, professional advice backed by years of experience. When you’re dealing with a broken water heater, we’ll give you the objective pros and cons of repairing vs. replacing the water heater. If the water heater needs replacing, we’ll explain your options in simple, clear language. Prevent Future Breakdowns with Regular Maintenance. Oil is a costly fuel. With an oil-fueled boiler, you need regular refills to keep your unit running. With a Gas Boiler, you’ll have a constant supply of heat and no longer need to keep track of how much oil you have left. According to the Department of Energy, natural gas is the most cost-effective energy source for homeowners. We offer professional oil to gas boiler conversions for improved energy-efficiency and cost savings for our customers. Contact us to learn more. If you decide that a gas boiler is for you, call Schaaf Plumbing & Heating for affordable upgrades and dependable repairs. We will provide you with a free estimate and walk you through the conversion process. You’ll have a wide selection of energy efficient models to choose from. Our technicians will ensure a quality oil to gas conversion and proper installation. We provide reliable service and repair for baseboard heat, but you might consider an upgrade to Radiant Heat. A type of hydronic heating, radiant heat uses hot water running through tubes beneath your floor to evenly disperse heat through a room. It frees your living spaces from the constraints of baseboards and radiators. Radiant heat is highly-efficient and provides the ultimate in comfort with consistent warmth. Nothing beats a warm floor beneath cold tiles during our long winter months. We’re expert installers, call us to learn more. When you upgrade your bathroom or kitchen, you’ll not only improve the appearance and the performance of these rooms, you’ll more than likely increase the value your entire property. Upgrade your bathroom and kitchen with the professional services of Schaaf Plumbing & Heating. From plumbing to appliance installation to heat systems and more, our technicians can provide you with top-notch upgrades. We work hard to provide our customers with the best deals in the area and help provide solutions that will fit within your budget. No-Hassle, Upfront Pricing. Customer Satisfaction. Contact us today at 201.945.4992 for a FREE project estimate. Whether you own a residential property or a commercial business, ask us about our business contacts. Dripping faucets could easily be ignored, until the water bill indicates that you have been wasting several hundred gallons of water. Replacing the faucet washer is often the solution, but if it’s not the problem, our technicians will examine your faucet to find the source of the leak and perform the proper repair. Yup, we do that too! When your toilet becomes clogged with foreign junk, don’t wait for the problem to get worse. With just one phone call, all of your problems can be resolved with friendly, professional help.